We’d love your help. Let us know what’s wrong with this preview of Payback by Gordon Korman. From the master of middle grade, Gordon Korman, comes the final book in the bestselling Masterminds series — about a group of kids who discover they were cloned from the DNA of some of the greatest criminal masterminds in history. After a serious betrayal from one of their former friends, the clones of Project Osiris are on the run again. Now, separated into pairs, Eli and From the master of middle grade, Gordon Korman, comes the final book in the bestselling Masterminds series — about a group of kids who discover they were cloned from the DNA of some of the greatest criminal masterminds in history. After a serious betrayal from one of their former friends, the clones of Project Osiris are on the run again. Now, separated into pairs, Eli and Tori and Amber and Malik are fighting to survive in the real world. Amber and Malik track down the one person they think can help them prove the existence of Project Osiris, notorious mob boss Gus Alabaster, also known as Malik’s DNA donor. But as Malik gets pulled into the criminal world — tantalized by hints of a real family — his actions put him and Amber into greater danger. Eli and Tori get sucked into even bigger conspiracies as they hunt down Project Osiris’s most closely guarded secret — who does Eli’s DNA come from? To ask other readers questions about Payback, please sign up. How many are in the Masterminds series? When did this book come out? This was definitely a great conclusion to the trilogy. They are finally able to find out why Osiris was founded, who was responsible, and how many clones there are. These are great books and I'm so glad that I took the time to finish the series. The narrators were excellent. If you haven't read these books check them out now. I will be doing a full review soon! In this final installment of Gordon Korman's excellent trilogy about kids who find out they are clones of criminal masterminds and the subjects of a research study called Project Osiris, the story is brought to a satisfying conclusion. This trilogy is so good that I would recommend it not only to middle-graders but also to teens and adults. Yes! 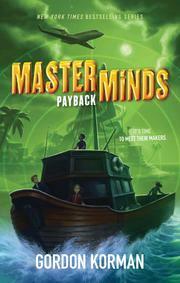 I finished book 3 in the Masterminds series. This one was just as good as the first two. There is a part in the middle where I was like, wait it seems over but half the book is still left, then the action started again. There were some twists that young readers may not see coming. There are even more impossible things in this book than the last one, but kids will love it even more because of the crazy, adventurous things the characters do. I honestly would have loved for this series to go on for another two or three more books, I was having that much fun with it. What a wild and exciting ride it was. So glad I got to go along on it. I know so many kids who are just crazy about these books, (and some adults too!). It's definitely a series to recommend to middle grade students who love stories with lots of excitement and adventure. A great end to an entertaining trilogy! I enjoyed the twist and turns of the plot, and the development of interesting characters. We left the children of Serenity in several bad situations in Criminal Destiny, (the adventure starts with Masterminds) and we pick up right where we left off. Amber and Malik are trying to escape the Serenity police, and are rushing down rapids, only to end up on the top of a truck speeding down the highway! Tori and Eli are also on the run, and end up finding a bit of comfort at a warehouse full of Girl Scout cookies, some of which they sell to get some money for their adventures. Malik finds out that the criminal from whom he is cloned, Gus Alabaster, has been released from jail because he is dying, and hunts him down. Gus believes that Malik is his long lost son because of the resemblance, and so a fair amount of time is spent doing errands and hanging out with Gus. Tori and Eli head to California in search of an actor who bears a striking resemblance to Eli, and uncover some very odd information about his cloning. When the children can't get any satisfaction from Tamara Dunleavy, who still feels she wasn't being evil, and see a news report that a criminal who has been in jail for twenty years is linked to a crime in a resort in the Bahamas, the group realizes that the adults who were running Project Osiris have escaped New Mexico and are hanging out in luxury. Using their criminal skills to charter a plane with stolen money and to liberate a boat to take them to the island, Malik, Tori, Eli and Amber find the other children. What is the best thing to do when you are a clone of a criminal being raised by morally suspect scientists? Korman knows his way around adventure and humor, and both are worked into Payback in amusing ways. When you're in a rural area, is it a good idea to steal motorcycles from a biker gang? Why not?! If you've been tossed about in river rapids, is plopping down on top of a speeding truck a good idea? Absolutely! While most tween readers (hopefully!) won't get a chance to have adventures like this, it's fun to imagine, and Korman has a great feel for what will amuse middle grade readers. The world building for Project Osiris and Serenity is very complete, and the children's adventures while trying to locate the criminal from whom they were cloned are both exciting and intriguing. The twist with the Hollywood actor was one that I didn't see coming. Adventure tales that weave in a bit of science fiction or fantasy are always appealing, and the Masterminds series will be enjoyed by readers of Peterfreund's Omega City, Salane's Lawless or Salerni's The Eighth Day. All of these tales pique the imagination and are great to think about while walking to school-- not that I have ever plotted how to escape mad scientists on MY walk in to work! Great end to the series. My 5th graders loved it! Great series!! Payback does not disappoint! This review has been hidden because it contains spoilers. To view it, click here. That was so good! I just wish something more had happened with Eli and Tori. But still rly good! Also, how came books like this end? Like, they have a last page. Can i file a complaint? Thrilling finale to the trilogy, action-packed and genuinely moving. Brilliantly narrated on audio. I'm genuinely going to miss these characters! My son read on ahead of me he loved the book so much. I finished the series on my own. I recommend this adventure for boys or girls ages 10-13, and their parents who enjoy sharing & discussing stories with their kids. good bang to the end of a great series. WHY DOES IT HAVE TO END!!!!!!! This book is a book for people who love the author Gordon Korman. This book is the 3rd book in the masterminds series. A great ending to the Masterminds series. Definitely check this out. At the end of book #2 Masterminds: Criminal Destiny, the four cloned friends , Eli and Tori, Malek and Amber get separated after betrayal from one of their own. Now, they are attempting to survive while also trying to outwit and escape the inhabitants and community of Serenity, New Mexico, where life was perfect...that is, perfectly twisted in a science-fiction sort of way. Figuring that they need to get some answers about their beginnings and the DNA that contributed to their existence, they tr At the end of book #2 Masterminds: Criminal Destiny, the four cloned friends , Eli and Tori, Malek and Amber get separated after betrayal from one of their own. Now, they are attempting to survive while also trying to outwit and escape the inhabitants and community of Serenity, New Mexico, where life was perfect...that is, perfectly twisted in a science-fiction sort of way. Figuring that they need to get some answers about their beginnings and the DNA that contributed to their existence, they try to gather information about the real criminal masterminds they come from. Eventually the four find their way back to each other and share gathered information. And, while some information is helpful, the most shocking news comes from one of the original founders of Project Osiris. Turns out that this person, now an opponent of the macabre project, is willing to help the clones live out a normal life. They also learn that the other clones and the leaders of Serenity are hiding out in the Bahamas. It becomes their mission to help the others break out from under the control of these so-called parents and learn the truth, the difficult truth, that Eli, Tori, Amber, and Malik found out many months ago. This review has been hidden because it contains spoilers. To view it, click here. I loved this book! I mean, I didn't like the whole gangster part of it (that was weird) but otherwise, it was great! The plot twist for Eli's clone was really well played. It totally fit! But I did suspect that The Crossword Killer wasn't him. One thing I wasn't totally happy with was the whole Eli-Tori thing! Korman openly declared about it (book one: You'd have to live in a closet not to notice that she's been developing a crush on Eli) (book three: Eli got totally jealous) but he DIDN'T DO ANY I loved this book! I mean, I didn't like the whole gangster part of it (that was weird) but otherwise, it was great! The plot twist for Eli's clone was really well played. It totally fit! But I did suspect that The Crossword Killer wasn't him. The clones from the Osiris Project have escaped and are now working in pairs to discover who their clone donors really are. Amber and Malik discover that Malik’s donor is an infamous gangster while Eli and Tori are attempting to discover Eli’s donor- a closely guarded secret. This is the final book in the Mastermind series. The book is filled with action, suspense and mystery. Of the three books in the series, this one is the best. It was hard to turn that last page and realize that the end of The clones from the Osiris Project have escaped and are now working in pairs to discover who their clone donors really are. Amber and Malik discover that Malik’s donor is an infamous gangster while Eli and Tori are attempting to discover Eli’s donor- a closely guarded secret. This is the final book in the Mastermind series. The book is filled with action, suspense and mystery. Of the three books in the series, this one is the best. It was hard to turn that last page and realize that the end of the Osiris Project was now. Fans of Korman will enjoy this book. It is perfect for the middle school reader- both boy and girl. Highly recommended for grades 5 through 8. A thrilling and satisfying conclusion of the Masterminds series. An exciting series that kids and adults will love. A trilogy that gets better with each book and an ending that I didn't see coming. Hier geht's zur Rezension auf meinem Blog. Der finale Band der Masterminds-Reihe war, abgesehen von einem relativ offensichtlichen Punkt, wieder so spannend, dass ich ihn einfach weggeatmet habe. Ich habe das ganze Buch in einem Rutsch gelesen und nicht einmal daran gedacht, mir Notizen zu machen. Nachdem sich die Handlung im letzten Teil etwas im Kreis drehte, spitzt sie sich in diesem Teil wieder zu, denn es läuft alles der großen Kon Hier geht's zur Rezension auf meinem Blog. Der finale Band der Masterminds-Reihe war, abgesehen von einem relativ offensichtlichen Punkt, wieder so spannend, dass ich ihn einfach weggeatmet habe. Ich habe das ganze Buch in einem Rutsch gelesen und nicht einmal daran gedacht, mir Notizen zu machen. Nachdem sich die Handlung im letzten Teil etwas im Kreis drehte, spitzt sie sich in diesem Teil wieder zu, denn es läuft alles der großen Konfrontation entgegen. Besonders spannend daran fand ich, dass ich mir jeden möglichen Ausgang gut vorstellen konnte. Projekt Osiris hat enorme Macht und da niemand den Kindern glaubt, bestand die Möglichkeit, dass sie tatsächlich wieder eingefangen werden. Auf der anderen Seite habe ich schon ein positives Ende für Eli und seine Freunde erwartet, in dem sie die Öffentlichkeit von ihrer Geschichte überzeugen und die Wissenschaftler festgenommen werden. Während des Buches wird aber mehrfach angebracht, dass sie in diesem Fall wohl auch keine selbstbestimmte Zukunft hätten, weil sich die Wissenschaft erneut auf sie stürzen würde. Es nicht öffentlich zu machen hieße aber auch, sich für immer vor Osiris verstecken zu müssen, sofern keine Alternative gefunden wird, um die Organisation auszuschalten. Zwischen all diesen möglichen Enden schwappt die Geschichte immer hin und her, sodass ich bis zum Ende nicht wusste, wie das Dilemma aufgelöst werden würde. Darüber hinaus hatte das Buch auch sehr viele realistische Momente, die die Charaktere vor Schwierigkeiten gestellt haben. Denn abgesehen von der Tatsache, dass sie Klone auf der Flucht sind, sind sie immer noch zwölf- und dreizehnjährige Kinder. Sie können keine Autos mieten, nur schlecht allein weit reisen, nicht allein leben und ständig müssen ihre Erziehungsberechtigten kontaktiert werden. Es hat mir gut gefallen, dass die Charaktere immer wieder vor diesen Schwierigkeiten stehen. Faszinierend fand ich auch wieder die Weiterführung des Experiments. Denn obwohl Eli und seine Freunde Projekt Osiris entkommen sind, stellt sich ihnen sowie mir natürlich bei jedem Gedanken und jeder Handlung weiter die Frage, welcher Aspekt sich nun durchsetzen würde: Gene oder Umwelt. Nachdem sie im letzten Band immer wieder gezwungen waren, Dinge zu stehlen, zu lügen und Gesetze zu brechen, hebt dieser Band die Beobachtungen auf eine ganz neue Stufe, denn es geht nicht mehr immer um ihr Überleben. Die Charaktere können frei Entscheidungen treffen und sich entfalten. Ich fand es sehr interessant zu beobachten, wie Malik immer weiter in die Mafia abrutscht und sich dort sogar wohl fühlt, während Amber mit allen Mitteln versucht, Gutes zu tun, um seine schlechten Handlungen auszugleichen. Der Autor hat erst ganz am Schluss durchblicken lassen, für welche (natürlich wissenschaftlich nicht belegte) Beantwortung der Fragestellung er sich denn nun entschieden hat: Gene oder Umwelt? I've been reading this series at the urging of my son. My son, who's not a huge fan of taking time to read. He loved this series, and couldn't wait for me to read them all, too. So, first, huge kudos for a great story that pulls in a kid who isn't thrilled to read! This story, and series, is really fun. Some of it may seem a bit unbelievable as an adult, but so fun, nonetheless. Definitely recommended for kids who want adventure stories! This book is a great finale to the series and it has a happy ending! I can't believe that Eli's "dad", Hammerstrom was finally caught and that Hector finally was their friend again! I am so happy they were able to free the other kids caught up in Project Osiris's cruel experiment! I love this book because it has a happy ending.